Welcome to a rather momentous edition of ARIA Chart Watch! Today we celebrate a huge 500 milestone, meaning that we’ve been bringing you this weekly wrap of the ARIA top 100s every single Saturday for more than nine and a half years. Quite the milestone, don’t you think? So much so we decided to put together a little graphic, just for today’s edition. But what’s making news on the Aussie charts this week? Well there’s no change to the No.1 spot on either ARIA chart, but as we approach the end of the year, there are top 20 debuts for a number of high profile albums. Who’s debuted where? 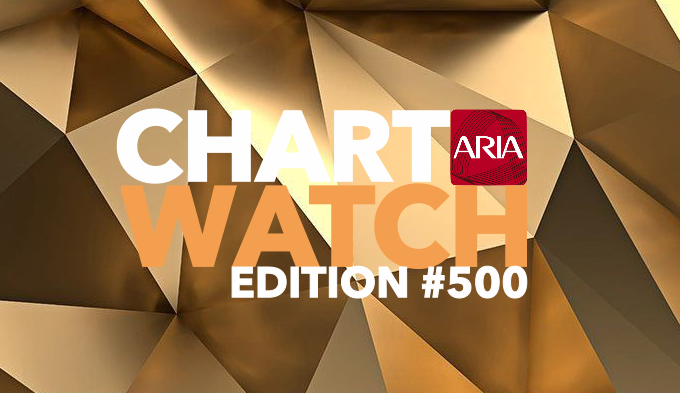 Read on to find out in our 500th edition of ARIA Chart Watch! As mentioned, there’s no change to the No.1 spot on the ARIA singles chart; Ariana Grande holding for her second successive week in pole position with her latest earworm, ‘Thank U, Next’. Not only does the song solidify its position atop the top 100 countdown this week, it does so with a fresh new gold sales certification, meaning it’s now sold in excess of 35,000 units in just three weeks. No mean feat. The entire top seven is completely unchanged this week. The rest of the top five is made up of Lady Gaga & Bradley Cooper, Halsey, George Ezra and Marshmello with Bastille (Nos.2-5 respectively). Though her track’s only been on the ARIA chart for seven weeks, Halsey’s ‘Without Me’ has done enough in the sales race to achieve a fresh new platinum accreditation (for sales in excess of 70,000 units). Loud Luxury’s ‘Body’ is up from nine to eight, Dean Lewis’s ‘Be Alright’ is down from eight to nine. That’s literally the only shift in the top ten, with ‘When The Party’s Over’ from Billie Eilish steady at No.10. Khalid hits platinum with ‘Better’ at No.11, just ahead of the new Rita Ora single ‘Let You Love Me’, which continues to improve, this week climbing two more places to No.12. Though it’s been no higher than No.17 thus far in its Aussie chart journey, The Chainsmokers’ ‘This Feeling’ achieves gold in its ninth week in. Ava Max is up again with ‘Sweet But Psycho’ (No.28 to No.22) and the ladies from Little Mix score a four place gain for ‘Woman Like Me’ (No.30 to No.26). Right behind them is P!nk’s rendition of ‘A Million Dreams’ from the new re-imagined soundtrack to ‘The Greatest Showman’. It’s up a huge 20 places from No.47 to No.27 as the album hits the stores. The song is now just one place shy of its No.26 peak thus far. Imagine Dragons’ latest offering ‘Bad Liar’ is up six from last week’s No.35 debut, while Lukas Graham is now teetering on the edge of the ARIA top 30 with their latest offering ‘Love Someone’. Maybe they’re not a one-hit-wonder after all! Tom Walker scores a platinum accreditation for ‘Leave A Light On’ (steady at No.34), but Lady Gaga and Bradley Cooper’s ‘I’ll Never Love Again’ is down nine to No.35. ‘Ruin My Life’, the new single from Swedish pop starlet Zara Larsson, bulleted 20 places from a No.71 debut to No.51 last Saturday. One week on, it’s up another nine and is now in the Aussie top 50 (No.51 to No.42). Lil Peep & XXXTentacion’s single is ‘Falling Down’ (No.33 to No.44), as is Ariana Grande’s ‘Breathin’, which falls from No.38 to No.51 after leaping from No.49 to No.38 seven days ago. The latter, however, is now platinum certified as it waves goodbye to the ARIA top 50. Queen’s classic ‘Don’t Stop Me Now’ is up another five positions to another new peak of No.53, while the Kygo/Sandro Cavazzo single ‘Happy Now’ is flying high. It soars 26 places to No.55 and, on current trajectory, is on track for an entry into the Aussie top 50 next weekend. A little further down, Amy Shark improves 12 with ‘I Said High’ (No.90 to No.78), while the new Ellie Goulding/Diplo/Swae Lee single ‘Close To Me’ is up 17 places from last week’s No.97 debut. An improvement for Guy Sebastian’s single ‘Before I Go’ too; No.96 on debut to No.87. But the news isn’t great for everyone. Imagine Dragons’ ‘Natural’, for example, plunges 31 places to No.90, while Eminem’s ‘Venom’ is down from No.76 to No.91. Ariana Grande’s ‘God Is A Woman’ also takes a tumble (No.78 to No.94). There are debuts for Zayn’s ‘No Candle No Light’ at No.95 and The Chainsmokers’ ‘Beach House’ at No.96. Sam Smith’s ‘Too Good At Goodbyes’ (now four times platinum certified for sales over 280,000 units) is back in the top 100 mix at No.98. DJ Khaled’s ‘No Brainer’ leaves the ARIA top 100 after 16 weeks in, but bids farewell sporting a fresh new double platinum accreditation, meaning it’s sold more than 140,000 units in its time in the hundred. Once again, no change atop the ARIA albums chart, with the power of Lady Gaga and Bradley Cooper still holding steady in the No.1 position with the ‘A Star Is Born’ soundtrack. This despite some tough, high profile competition; quite the feat. Canadian crooner – and perennial Aussie favourite – Michael Bublé is left to the No.2 position for his own with his latest long player ‘Love’. The soundtrack to ‘Bohemian Rhapsody’ from Queen is at No.3. And it’s followed by two more top five debuts; the soundtrack to ‘The Greatest Showman : Reimagined’ at No.4 and the new Mumford & Sons album ‘Delta’ at No.5. Plenty of Queen elsewhere in the top ten too; No.6 for ‘Greatest Hits’ and No.7 for ‘The Platinum Collection’. Little Mix also score the top ten love down under with their new album ‘LM5’; new at No.8 (at this stage their lowest charting album here since their debut back in 2012). The original soundtrack to ‘The Greatest Showman’ enjoys a bump, up from No.11 to No.9, while Ed Sheeran’s ‘÷’ is back into the top ten (No.13 to No.10) as pre-Christmas sales start to gather pace. Imagine Dragons’ ‘Origins’ drops from a No.4 debut to No.12, just ahead of debuts for Mark Knopfler’s ‘Down The Road Wherever’ (No.14) and Mariah Carey’s ‘Caution’ (No.15 – her lowest charting non-Christmas album since 2002’s ‘Charmbracelet’). Bubes is back again in the No.16 position. As the festive season nears, his perennial favourite ‘Christmas’ is back again, improving from No.30 to No.16 (making it two Bublé albums in the top 20). There’s a debut for Kip Moore’s ‘Room To Spare : The Acoustic Sessions’ at No.18 and another for Anderson Paak’s ‘Oxnard’ at No.20. Taylor Swift’s ‘Reputation’ is down eight after her Aussie tour (No.14 to No.22) and The Beatles’ ‘The Beatles’ is down from No.10 (re-entry) to No.26. Midnight Oil’s new live record ‘Armistice Day : Live At The Domain Sydney’ is down a little further, however; dropping from No.5 on debut last week to No.27. Human Nature’s ‘The Christmas Album’ flies in for another year (No.37 to No.28), as does Red Hot Chili Peppers’ ‘Greatest Hits’, given the announcement of their tour during the week (No.30 on re-entry). We’ve got a debut at No.32 for Roy Orbison & The Royal Philharmonic Orchestra’s ‘Unchained Melodies’, but big second week drops for Ziggy Alberts’ ‘Laps Around The Sun’ (down 30 to No.39) and Muse’s ‘Simulation Theory’ (down 33 to No.40). Rüfüs Du Sol’s ‘Solace’ also falls this week, though only by 14 – to No.43. Mark Vincent is into the top 50 for the first time with his festive collection ‘The Most Wonderful Time Of The Year’ (No.51 to a new peak of No.47). Luke Combs also hits the top 50 (on re-entry) with ‘This One’s For You’ (No.54 to No.48). Metro Boomin are headed in the opposite direction, however, down from No.35 to No.51 with ‘Not All Heroes Wear Capes’. More Mariah Carey action just outside the top 50, with her seminal classic ‘Merry Christmas’ racing back up the countdown prior to the silly season. It’s up another 21 places to No.52 this week and should easily be top 50 (maybe even top 40) by this time next week. The Chris Cornell self-titled set is new at No.53. Lil Peep only troubled the top 50 for one week with his ‘Come Over When You’re Sober Pt.2’. It debuted at No.15 last week, but loses a huge 39 positions in week two to be down at No.53. Paul Kelly’s ‘Nature’ is also down heavily, losing 22 places to No.56. Architects’ ‘Holy Hell’, however, falls even further, plunging 49 places from last week’s No.8 debut. The Smashing Pumpkins are in with ‘Shiny And Oh So Bright Vol.1 / LP : No Past No Future No Sun’ at No.63, but Disturbed’s ‘Evolution’ continues to falter (No.40 to No.65). Twenty One Pilots’ ‘Trench’ is down 13 (to No.66), Matt Corby’s ‘Rainbow Valley’ slumps 41 (to No.67) and Jonas Blue’s ‘Blue’ is down from a No.50 debut to No.68. The news is even worse for Trippie Redd, however; new long player ‘A Love Letter To You 3’ plummeting 55 places, from a debut of No.36 to No.91! He’s a long, long way from his former chart glory here in Australia, but a No.97 debut for the new Andre Rieu album ‘Romantic Moments II’ shows there’s still some love for him here. The final three places of this week’s top 100 are taken by John Butler Trio’s ‘Home’ (down 24 to No.98), Joji’s ‘Ballads 1’ (down 29 to No.99) and Chillinit’s ‘Women Weed & Wordplay’ (down 19 to No.100). Kane Brown’s ‘Experiment’, which debuted at No.33 last week, is gone entirely from the top 100. Also gone from the top 100 this week is Ariana Grande’s album ‘My Everything’. Though it does part ways with the countdown armed with a new platinum certification; that’s 70,000 copies sold down under.